The Prince of Wales and The Duchess of Cornwall carried out their annual visit to the South West this week. The Prince of Wales (known as The Duke of Cornwall when visiting the South West) and The Duchess of Cornwall first began the week visiting the Cornish town of Fowey. Their Royal Highnesses joined in with the festivities at the Celebration of Fowey Festival, where they named Fowey Gig Club’s new gig and met local residents. In St Agnes, The Duke and Duchess visited clothing company Finisterre clothing, which produces sustainable functional products for those who love the sea. The company was formed 15 years ago using a loan from The Prince’s Trust. The Duke then joined part of an Ocean Plastic Solutions Day conference, which was organised by national marine conservation charity Surfers Against Sewage and Finisterre. 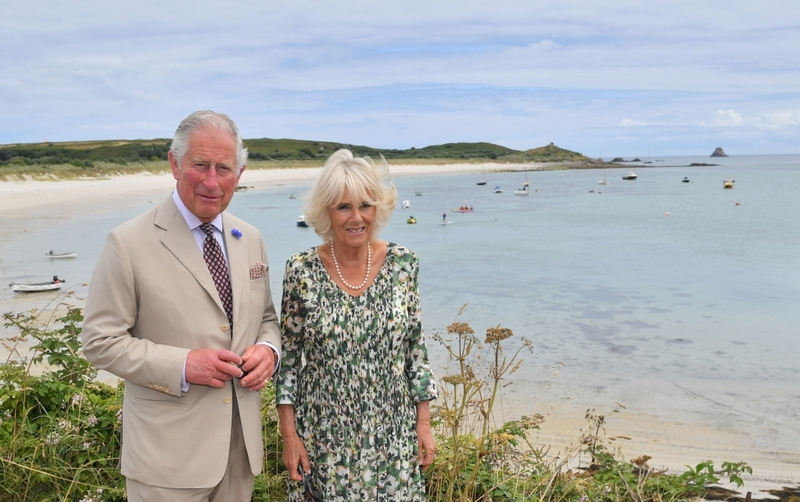 On Tuesday, The Duke and Duchess of Cornwall visited the Isles of Scilly. First visiting St Mary’s, Their Royal Highnesses officially opened the island's newly improved quayside and toured the new harbour-side restaurant, 'On The Quay’, where The Duchess was presented with a birthday cake! The Duke of Cornwall meets a resident of St. Martin’s during the visit to the Isles of Scilly today. The Duke and Duchess made several visits across the island including to the fish and chip shop, the bakery and church. TRH also met members of the emergency services operating on the island. This afternoon, The Duke of Cornwall attended a meeting on how to deliver smart solutions to energy, waste, water and sewerage. After taking a boat to the island of St Martin’s, The Duke and Duchess were greeted by local residents before they visited businesses and met members of the emergency services. Read more about the week on princeofwales.gov.uk.